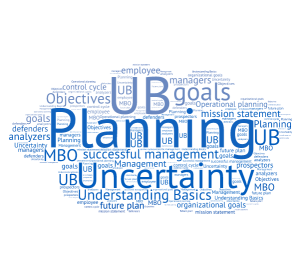 Planning & Uncertainty Planning can be described as charting up..
Planning can be described as charting up of goals and formulating a way to achieve the set targets for successful management. There are four main benefits that can be achieved from planning. One is being checking on the progress. Second being coordinating activities. Third being thinking about future. Fourth being able to cope for uncertain events. In case of uncertain event the organization usually follow one of the four responses that are to employ defenders, prospectors, analyzers and reactors for successful management. A mission statement can be defined as the goals and objectives set by an organization.its purpose for commencing business and a vision statement are those steps which the organization might follow in achieve the goals and objectives set in the mission statement. In order to pursue these statements the successful management develops strategic planning, tactical planning and operational planning. These planning vary on the time period for each. The strategic planning is for more than a year. Tactical planning is for six months to twenty four months. Operational planning is from 1 week to fifty two weeks. Strategic planning is done by top level management. Tactical planning is done by middle level management. The operational planning is done by front-line management. The organizational goals should be logical. They should based on a concept called SMART, which stands for specific, measurable, attainable, result oriented and a target date. These goals need to be well thought. Action plan has to be developed for it. Action plan can be prepared for routine activities like normal business operations or single-use for one time activity. Management by objective is a well known term which stands for four steps in goal setting. The first steps require management to indulge the employees into the planning procedure and develop organizational targets by working together. In the second step the management needs to develop an action plan for the employees to follow. In the third step, the managers and employees need to evaluate and review employee’s performance. In the fourth step the management needs to reward the well performing employees because this adds a motivation factor in the workforce. MBO can be successful only when the top level management seriously gets involved, when whole organization gets involved and objectives are clearly communicated to every employee.